You see it everywhere. 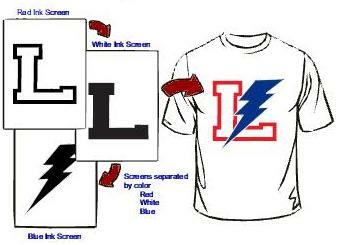 Uniforms, t-shirts, sweatshirts bags. It utilizes a very basic concept. Passing ink through a fine mesh screen until the ink is deposited onto the finished product. Screen printing can accomplish the most intricate of designs. The finer the screen the more detail can be shown. First the image has to be designed using vector art. This takes out all of the unwanted jagged bumps along the design lines. After the art is designed, it is broken down into individual colors (as seen in picture). Printed from the computer onto a film transfer. That transfer is laid onto the screen and placed into a spacial light box to expose a screen. This removes the transfer printed area from the screen creating a hole for the screen ink to pass through. Sooooo... how much does it cost? Similar to embroidery it is based on the artwork, quantity, and colors in the design. This is all captured in a simple formula. Ready? The formula is the number of ink colors times quantity of shirts plus number of screen used. To get a quote for your project give us a call or send us an email with the artwork or click on the online quote form below.